The most important thing to do after a fire is to clean off the greasy soot from the fire. The soot is acidic and eats right into the silverplate or sterling. In the two right photos above you can see how the objects on the tray created a shadow that protected the tray from the soot damage of the fire. 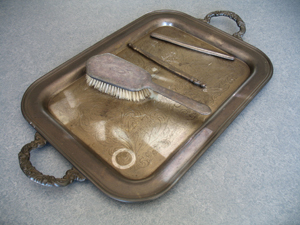 After the initial cleaning of this silverplate tray to remove the soot from the fire, I did an experiment. The left third was polished very conservatively with a polishing machine and buffing compound. The center third was polished with silver polish by hand. The right third was left untouched. You can still see the slight tarnish from the fire on the right. Hardly perceptible in the photo, the left third was just slightly "warmer" in appearance, but the hand polished section looked totally acceptable. It is important to clean sterling and silver plate immediately after a fire to remove grimy soot and dark oxidation. In this photo, all of this silver was cleaned but it still needs to be polished. The great news is that there will be no further damage from the fire. Fire damage to sterling silver and silverplate is a serious issue. The smoke and soot leaves a black, greasy, film that can literally eat into the metal . This soot should be washed off as soon as possible. 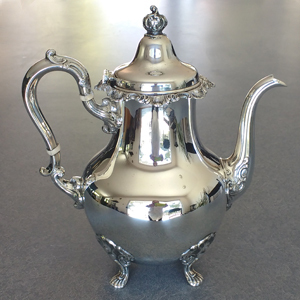 This sterling silver coffeepot, teapot, sugar, creamer and tray were on display in the customer's home. During the fire the coffee and tea service was exposed to the worst smoke and soot. In addition, during the fire the teapot was knocked over, the side dented, spout dented and the lid was stepped on. If you look at the right photo you can see the the sugar lid protected the inside of the sugar bowl so was not exposed to the fire damage. That is why is looks "white" or silver inside. In the left photo, the silver is cleaned, but it still needs to be polished. The damaged lid to the teapot was fixed which you can see below. This sterling silver teapot was damaged during a fire. It arrived covered in soot with a black, greasy tarnished surface but the more serious damage was that the lid was stepped on by fire fighters. This is why the lid is stuck up in the air. In addition, the tip of the spout was damaged, and there was a dent on the side. It took great skill and three weeks to repair this teapot. I like to work on such difficult repairs very slowly as it can be very challenging to fix a lid that is stepped on.